Hear from NDAC member, Julie Rothholz, about her experience in advocacy and more about the Boot Camp. The Disability Policy Seminar is the premier opportunity to cultivate supporters on Capitol Hill and amplify the concerns of people with intellectual and developmental disabilities (I/DD) before Congress. For 42 years, the Seminar has offered the opportunity to come together with passionate advocates, including people with disabilities, experts, and professionals in the field, to learn about key issues and advance the grassroots movement for people with I/DD. With a new Congress settling in, it is crucial to fortify our advocacy for the year ahead. 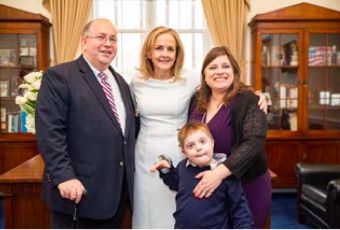 The 116th Congress provides an opportunity to build new connections, establish allies on Capitol Hill, and continue to expand and protect progress on disability rights legislation. We need you in Washington, DC to advocate for the programs that people with disabilities rely on to make a life in the community possible. The Disability Policy Seminar is your chance to make an impact! The event is packed with informative sessions from experts in the field, and opportunities to discuss key issues with others from your state. Armed with valuable information, the event culminates with the attendees converging on Capitol Hill to speak directly to their Members of Congress about the high-priority issues that affect them most. ● Any disability rights activists! The challenges facing the disability community demand our continued focus and diligent advocacy. The historic Olmstead Supreme Court decision ensures the rights of people with disabilities to be served in their communities. While the impact of the decision on the adult disability service system has been huge, recent attacks remind us why we must remain vigilant. Come and hear from advocates about the past, present and future of the promises of Olmstead. Experts from the Hill and advocates will discuss current efforts to increase opportunities for competitive, integrated employment. Paid family and medical leave can be a major benefit to people with disabilities and their family members. Learn more about legislation promoting these policies. ● Voting issues and preparing for upcoming elections. Over the years, improvements in increasing voter turnout among their citizens with disabilities have been made by organizations and states. To advance these efforts, more must to be done to ensure that all people with disabilities have the ability to access everything they need to vote in their elections. Every person with a disability should be supported to make every decision that they can from big to small. As we have moved from a system of, at times, overly restrictive guardianship to supported decision making agreements; come hear from advocates about how they have operationalized that at the state level.